By Elaine Smith – she is development manager at Instituto Geração. What is the title for an activist that protests so much that he ends up changing everything around him? Or what can you find in common between a Belgium monk that trains rats and a Canadian teacher that teaches empathy for kids, or how to define a Brazilian priest that became a banker? These are exactly the punch lines opening the trailer of the film Quem se Importa, which means ‘who cares’ in the director Mara Mourao’s native Portuguese. Following her other social movie Doutores da Alegria in 2005, she is now back in theatres with a fantastic film about social entrepreneurs. 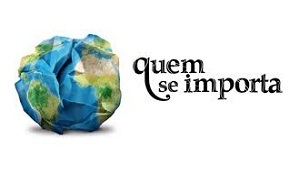 Despite being Brazilian, the film is very international in its nature given that two-thirds of the entrepreneurs’ testimonies are in English. It was inspired by the book How to Change the World by David Bornstein (2007). And the trailer also says that this is more than a film – it is a movement. I share this idea. I had the chance to see the film just before its opening day in Sao Paulo, in an event sponsored by Mattos Filho Advogados, one of the many firms that sponsored the film. I gladly saw Mattos Filho’s clients filling the four rooms where the film would be shown simultaneously. And I also shared the joy and fulfillment a lot of these business managers were feeling by the time the lights where turned on. I saw tears among viewers, not only the ones involved in the social arena, but also among people that for some reason are just not involved yet. The film starts by explaining in simple terms the definition of social entrepreneur. There are 18 social entrepreneurs in the film (I’ve listed all below, along with their organization websites) and there is a lot of personal sentiment supporting the intention of those individuals working in what was initially considered a crazy idea but is now going mainstream. We are talking systemic change to a situation that might change the life of thousands of people. The main idea of the film is that everyone can change the world. One of the main elements for such change is innovation. There are so many marvellous testimonies from these social entrepreneurs that I feel bad in picking a couple. But these changemakers are already changing the world, it is such an honour to share their thoughts. For instance, Premal Shah, from Kiva in the US, says: ‘Don’t ask what the world needs, ask what makes you feel alive, for the world needs more people to come alive.’ Unsurprisingly, I copied that straight to my Facebook page status. He also has a brilliant comment about the ‘ovarian lottery’; I had heard this idea before from Warren Buffett, in short saying you cannot control where you are born, but you are coming with some skills to this life of yours. Socially speaking, Shah brings the same theory back into question saying you cannot control whether you are born in a wealthy family in Manhattan or in a tribe in Central Africa. But there is a lot to accomplish either way. Documentaries are short-lived in movie theatres. An Inconvenient Truth by Al Gore in 2006 was an exception. But I also know that social media has changed things over the last 6 years. I cannot wait until pieces of Quem se Importa spread out over YouTube and social media pages. I want to Google ‘Muhammad Yunus’ and see his testimony in this film, along with his Nobel Prize website comments. I want to hear that Harvard students are using the film for their case studies on microcredit or the many other business models that we see in this film. By the way, two classes of Harvard Kennedy students already saw the film. But I hope it may become epidemic soon. Mara Mourao combined in a very powerful way examples of investments in the environment and social areas, and how these need to go mainstream. I cannot wait until the DVD is released (expected time for the launch is July), so we can distribute it in public and private schools. The director is in touch with six international distributors of films, and I would imagine the curiosity of investors could ignite more international interest in the subject. Muhammad Yunus says we are not guests in this world. We are creators and we are able to imagine what kind of world we want before we start the creation process. It is part of our social responsibility to use the best of our abilities to create a different world.